Firstly, you can determine if Botox® is the right treatment for you. We’ll invite you in for an initial consultation appointment to discuss the results that you want to achieve and ensure that they are attainable with the treatment you are having. We’ll ask you to complete a medical history form, which will help us to confirm that Botox® is a safe treatment for you. Botox® is a prescription only medicine, so the product needs to be prescribed to you if it’s your first time having the treatment done at SkinHD. We can see you for a consultation and then do the treatment when the product arrives in for you – normally 24 hours later. Consultation appointments at SkinHD are free, and there is no obligation to continue with the treatment if you are not happy to do so for any reason. Once you’ve had your initial consultation and are due to have your first treatment, there a couple of medications that you may want to avoid to help reduce any potential bruising, swelling and bleeding. for a week prior – as these can all thin the blood – to help avoid bruising and bleeding. Please consult with your doctor before stopping any prescription medications. Don’t forget to have a little something to eat just before your treatment, to ensure your blood sugar levels won’t leave you at risk of fainting if you’re particularly nervous around needles! Botox® appointments are usually quick and easy, typically lasting no more than 20-30 minutes. We’ll re-read through your medical history form and check that nothing has changed since your consultation. We’ll run through any potential risks and advise of any side effects and confirm you are still happy to go ahead with the treatment. It’s not really necessary for numbing cream to be applied beforehand as we use really thin, fine hypodermic needles. It’s not necessary to remove make up as we will always cleanse the area before the treatment. We’ll ask you to make a couple of facial movements, such as frowning or raising your eyebrows and mark the areas to be injected. If you’re particularly nervous or needle-phobic, practice some slow, mindful breathing or listen to music before we start the procedure. We may apply ice to any injected areas afterwards to help reduce swelling. 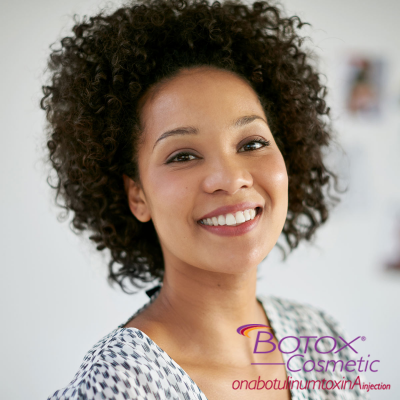 Botox® is a great and quick procedure, with little to no downtime afterwards. Immediately after the treatment, you may experience a little redness and swelling at the injection sites, like little bee stings, which will normally subside within an hour of your treatment. What to expect – side effects are minimal but there is a small risk of redness, swelling, bruising after your treatment. These effects should only last a couple of days. You can use ice packs to help reduce any side effects. We would say wait a couple of days up to a week before any major social events if you want to give it enough time for any side effects to subside. If you ever Google Botox® side effects you will be inundated with images of people with a severe ptosis where the forehead drops pushing the eyebrows down, making it difficult to lift the eyebrows and causing a heaviness in the brow area. This is an extremely rare side effect which is quite often dose related, and only associated with having Botox® in the forehead and not the Glabella. Obviously some people are more at risk than others, so if it is your first treatment at SkinHD we will inject a small amount in the forehead area and book a two week review appointment, you can always add more Botox® but you can’t take it away! Don’t overly rub or massage the area for 24 hours post treatment. This may cause the product to migrate and runs the risk of infecting the area. Avoid wearing make up for at least 2 hours post treatment – this allows the skin to form a protective barrier at the injection sites and reduces the risk of infection. When washing your face, pat the skin dry and apply any make-up/moisturiser in a light sweeping motion. Don’t make exaggerated facial movements for 4 hours post treatments. In the past clients were told to make exaggerated facial movements to work the Botox® into the muscles, but new research shows that normal expressions are enough to make this happen. No excessive sweating for 24 hours post treatment, so avoid extremely hot baths/showers, saunas/steam rooms, sunbeds and cardiovascular exercise. Wait at least 24 hours before having any other facial treatment done, including facials, chemical peels or microdermabrasion. This ensures the product doesn’t migrate to any other area and won’t exacerbate any bruising. Avoid smoking! Smoking can increase the appearance of facial wrinkles, and can also increase the risk of bruising in the procedure. You may want to apply arnica cream if you bruise particularly easily. After 14 days you may require a top-up, especially if this is your first treatment with us. All top ups will need to take place within 3 weeks of your initial treatment. The results from your Botox® treatment should last 3-6 months. After 3-4 months you may start seeing some movement in the area again. Some people are happy with a little bit of movement so wait to book back in, but others will prefer to maintain the look and book in every 3-4 months. If you’d like to talk to us more about Botox® or other Wrinkle Relaxing Injections, please contact us on 0161 974 0212 to book in for your free initial consultation or fill out our contact form and we’ll get back to you.